Sickle cell anemia is an inherited genetic disorder of the red blood cells. The abnormal sickle shaped red blood cells are the main cause behind the complications associated with sickle cell anemia. But what causes sickle cell anemia in the first place? That’s where genetics come in. A mutation in the DNA is what causes sickle cell anemia, by disrupting the properties of hemoglobin. Sickle cell anemia is inherited in an autosomal recessive manner, which means that if both the genes that a child inherits from his parents are defective, he’s prone to sickle cell anemia. However, if only one defective gene is inherited during birth, the individual becomes a carrier of the sickle cell trait. This means that while the individual may not show any symptoms of sickle cell anemia, he’s likely to pass on the condition to his child if his partner (the mom) also carries the sickle cell trait. Sickle cell anemia facts dictate that there’s a 50% chance of the disease being passed on to kids. In the case of parents who are carriers of the sickle cell trait, there is a 25% chance that they’ll have a child with sickle cell anemia. Sickle cell anemia was one of the first genetic diseases to be described at a molecular level. A single mutation in the DNA is responsible for this condition. It has been hypothesized that this mutation might have occurred in the DNA spontaneously in different populations. The single change disrupts the shape and the chemical properties of the hemoglobin, protein, and iron composite in the red blood cells. In healthy and regular individuals, the body produces hemoglobin A, whereas in sickle cell anemia patients, the body produces hemoglobin S, an abnormal form. The abnormal hemoglobin S components join and create strand-like structures that elongate the red blood cell and give it a sickle-shaped structure. Although the defective gene is prevalent in Europe and Asia, a majority of Africans are carriers of the mutated gene. Another possible cause of sickle cell disease is thalassemia, which is a kind of blood disorder that is inherited in the same autosomal recessive manner. 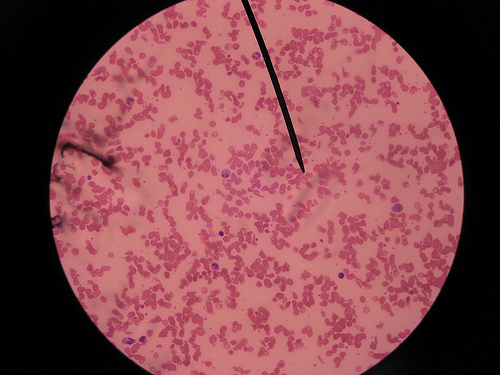 In individuals with thalassemia, an abnormal type of hemoglobin is produced. This hemoglobin damages the red blood cells, resulting in anemia. If one parent is a carrier of the thalassemia trait and another parent is a carrier of the sickle cell trait, there is a 25% chance that the child will inherit both the defective genes. This condition is known as sickle thalassemia. The manifestation of clinical symptoms in this case might range from mild to severe, and differ between individuals. Understanding what causes sickle cell anemia can help you cope with the disease and make long term management plans. It is important to opt for sickle cell anemia treatment measures once the condition has been diagnosed. This entry was posted in Sickle Cell Anemia and tagged causes of sickle cell anemia, sickle cell anemia causes by Dr. Smitha Rame Gowda. Bookmark the permalink.